Last month, our team gathered for a few days together with our families. It was a time to reflect on what we most appreciate, and what are our hopes are moving forward. My favorite part of the week was when we took the time to share our "last will" and what we would give to or leave each other. Most of us cried at least once and we all realized that our strength lies in the support we receive from those around us. Make sure that you invest in your team- whether it be the personal or professional players around you. 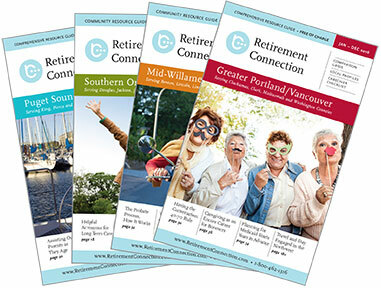 The Retirement Connection Guide is prepped for print and will hit the streets starting Sept 24th. We will deliver to all hospitals, libraries, senior centers, area agencies on aging and many other locations in Mid Willamette Valley. Let us know if you would like additional copies; it is a great resource to share and use as the trusted advisor for those you serve. Topic: Dressing for Success. How to get the best from your "Dress"! I am very grateful to be surround by awesome team members- personally and professionally. But it doesn’t happen without effort. Make sure you learn from your all stars, compensate for injured players, and work to strengthen your new players. You will only be as strong as your weakest link and sometimes realize that link may be you.